It is quite common that once you reach a certain age, your reaction New Year's Eve is one of reflection; on hype and hyperbole; overpriced tickets; and memory loss. The transition from one year to the next is usually overrated. At least, that is what I thought before I started snowboarding. With the post-Christmas hangover weighing heavily on my mind there is nothing I like better than to banish myself to a cabin up in the north of Sweden and escape for some vertical therapy. This year, we were 8 hours' drive north of Stockholm in Björnrike - ominously translated as 'Bear Country'. 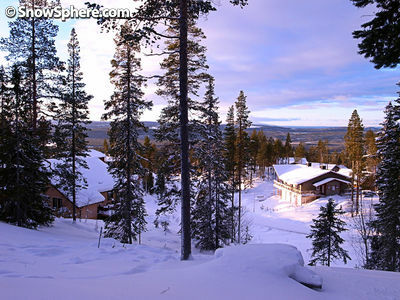 This relatively small, family resort in Vemdalen is one of my favourite annual retreats. We rented a stuga with a sauna, stock up on booze and some choice food and settle in for a private and personal celebration of the year that is about to pass. From a distance, snowboarding in Sweden is not going to compete with the Alps, North America or Canada. It provides rugged rolling hills rather than mountains, but the scope and diversity on offer once you start to explore is worth the effort. There is something for everyone, from harder and easier pistes at the front, to pure freedom at the back of the mountain. This is also home to Björnvallen, a much-loved children's area, though thankfully bears are rather thin on the ground. Snow - and lots of it - is guaranteed. The smooth blanket that welcomes visitors up in Vemdalen is a reassuring constant. Plus a new and powerful snow system has been installed for the alpine clubs, which can lay 2 feet of white stuff over the whole of Björnrike in just 5 days. The end of December can be painfully cold. It was down to minus 20 at night this year but a cool minus 8 during the days. The mornings are bright, clear and crisp but goggles are essential because this can change dramatically to a blinding white out after lunch. The clean evergreen slopes are thick with snow, with many a corduroy path carved into the thick wooded off-piste corridors. A defining feature of Scandinavia is the sense of space and tranquillity. 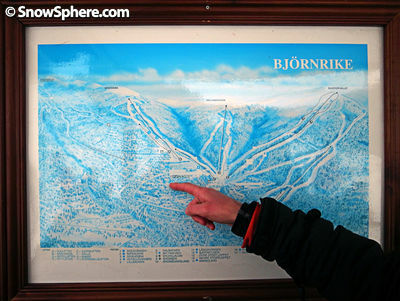 Björnrike is a family resort and although it is not huge you have a luxurious abundance of space. There are no queues for the lifts; no overcrowding on the slopes; the natural beauty is preserved and meticulously clean; everyone is very polite - if a little cold. But that's just the culture here - it is too cold for small talk - the honesty is pure, refreshing and relaxing. There was a new addition to Björnrike this year - The Grizzly Express - the longest and highest 6-seater chairlift in Sweden and the fastest in Scandinavia. It is a joyful 2,043m long with a vertical height of 470m, and the journey to the top takes less than six minutes. And as you know, shorter lift times mean more skiing time - and that is never wrong. On New Year's Eve we enjoyed a rather lazy few hours gliding around the mazy collection of slopes, stopping for lunch in the Brasseriet and wrapping things up before darkness fell at around 15:00. 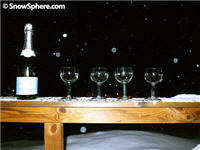 Naturally, the cabins are all conveniently located on the slope or gathered at the base of the lifts. Ours was modest, but fitted with a sauna, which is not only congruent with cultural stereotype but also the perfect way to warm-down and stretch those aching muscles. It is customary to drink beer in the sauna. However, my weapon of choice this year came recommended by my girlfriend's father Rolf; 3 parts Jim Beam, 1 part Grand Marnier - sweet and strong. New Year's Eve passed in the cabin eating fillet mignon and playing games like Mutant Charades and Scrambles. When the talking clock (or 'Mrs Time' as it is known in Sweden) said 10 minutes to midnight the fireworks started. Imagine 200 isolated cabins in the woods setting off 100 fireworks each - it was like the Blitz, only slightly more compelling. Comrades spilled out from their homes and rolled over to their neighbour to wish them a 'Good Continuation'. The cheap champagne flowed. The cold air was filled with the authentic warmth of a shared experience. We took a walk, out onto the powdery slopes, out into the woods, and as suddenly as the celebration had begun it evaporated again into the still night air - leaving a natural composition as serene and beautiful as a bride. Back in the secure confines of our warm cabin, Sweden had beaten Canada in the hockey too, 6-5 on penalties. It was quite a party. The next day we were on the slopes again by 10:30, clear headed and philosophical about the New Year, although it was just another beautiful day. The girls went cross-country skiing -10km of smooth and sophisticated aerobics across the rolling banks of countryside. We preferred to try some of the more challenging and unchartered areas, physically pushing our individual limits once more on the boards and seeking solace from any cloudy or frosted thoughts. Scandinavian design is reputedly the perfect fusion of beauty and functionality. 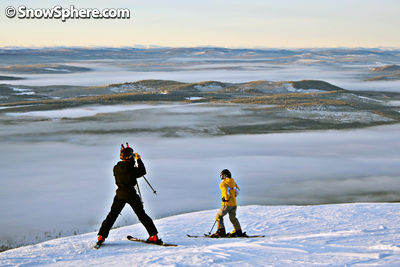 And snowboarding in Sweden is just that - efficiently stunning and wonderfully accessible. What I love about snowboarding on New Year's day is that it wipes the slate clean. It is a pure and innocent start to the year that blows away any cobwebs and fills me with joyful gladness. My 2011 will be about optimism, new beginnings, and taking time to stop and smell the roses. Andrew O'Sullivan is a freelance photographer based on Södermalm, the world famous southern island on Stockholm's archipelago. In recent years his passion for photography has been matched only by his enthusiasm for snowboarding. View Andy O'Sullivan's portfolio and commissions here.